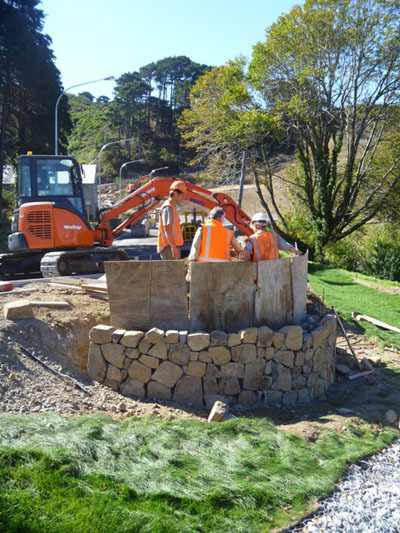 The Glenside community and Wellington City Council have worked in partnership to design and construct a memorial for an early settler woman who died and was buried in the locality in the winter of 1841. It is thought to be the winter of 1841 as in 1842 a letter was written describing the woman as being buried the previous winter. The original burial site was consecrated on 10th October 1842 by Bishop Selwyn of the Anglican Church when he passed nearby on his journey north from Wellington. 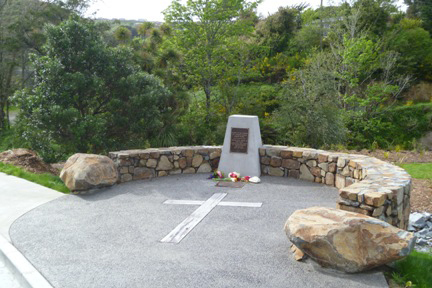 The plaques on the memorial was unveiled on 10th October 2013 in a ceremony attended by the community and Sir Tamati Reedy, Reverand Ben Frow-Johnson, the Mayor of Wellington Celia Wade-Brown and MP the Hon Peter Dunne. The WCC-prepared memorial design proposal is here. (PDF 1.4 MB). It has three pages. This page provides updates on activity relating to the memorial. The Memorial plaques are unveiled. At 2:00 pm on Thursday, 10th October 2013, a ceremony was held to unveil the plaques on the memorial. Members of the public were invited to attend and place flowers at the site in memory of the early pioneer woman for whom the memorial was built. 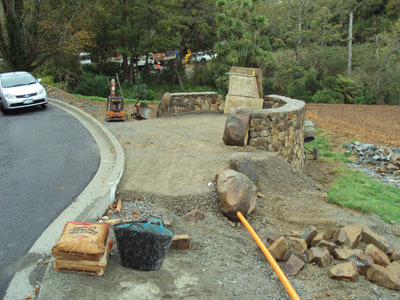 The Memorial under construction - a landscape designer and his team will move the rock "hands" around until it they are satisfied with their placement. The memorial begins to shape up. The rocks are from Horokiwi Quarry. 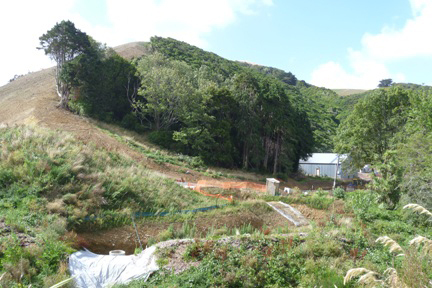 The community ideas for the memorial were passed to the Wellington City Council Heritage Unit. Wellington City Council designers A Clarke and C Gordon have taken the words of the community and turned them into a design. The design was consulted at the Glenside Progressive Assn. Inc. meeting on Monday 25 March. Meetings were held with Wellington City Council Heritage Unit Vivien Rickard and with representatives of the Glenside community to discuss the memorial. The ideas were put down in writing and passed onto the Wellington City Council art design team. The following is a summary of what was discussed. To professionalise the design and make it beautiful. To communicate the significance of the memorial site not only to Wellington, but to the Country i.e. it has national significance being the first known recorded consecration Bishop Selwyn carried out on his first visit to Wellington. There are very few memorials to women in NZ. Thoughts from the community on a memorial design. A community summary with photographs of early NZ memorials including memorials to early colonial; women and Maori. The community ideas that would work best. The site would be self contained with minimal requirement to maintain it. It would not be a grassy site as this meant mowing. It is paved – no maintenance. The curve of the shape is defined by “arms” reaching around. These arms are a low wall that curve around the paved area. People can rest on the arms. The paved place where people walk is the gathering place. E.g. When you are gathered, or standing in this place, you then look at the Memorial stone. The Memorial stone has a plaque on it, with words explaining that it is a Memorial, and a Bible verse from the old Bible text that would have been used by Bishop Selwyn and was used at the blessing 167 years later by Vicar Nimmo. The words “moe mai ra” “Rest in Peace” to be included. In the paved area, there is an opportunity for a floor plaque which could provide more information e.g. about the women’s husband, the Wall family and the Bishop & his Maori entourage doing the blessing . The technical generation in the community had asked for an App, linking to a website with more information. There is a possibility to explore the idea of putting a geo-cache within the wall. There would be a pohutukawa to one side of the Memorial site, which would grow and overhang it. The tree would be named, and the name of it would be in Maori, and the community would consult that. The Council have offered an area of road reserve close to where the woman was buried and will provide two car-parks to access it. They have also offered the services of one of their heritage advisor's to assist with the design. 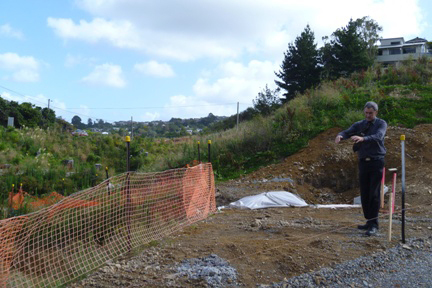 Glenside residents met with Wellington City Council in 2008 to discuss their ideas for a memorial before construction of the road began. These ideas will be taken into consideration as part of the memorial design. Put the history of it on a website, ours and Council’s.